You’re engaged….yay!! I remember the feeling of excitement mixed with the “what now! ?” I proposed to to my now-wife Alyssa at Deer Lake Park, in Burnaby, a place just blocks away from her childhood home, and a place we’d walked around many a time together. That was on a beautiful evening in June of 2015! We just happened to to snag the last Saturday of the next summer for our wedding reception, the Hart House! When it comes to engagement photos, there are SO MANY PLACES to choose from, especially for those of us who live in the Vancouver area. We’re surrounded by beauty everywhere we look! I love asking my couples to think of a few places that are sentimental to them, whether it be the place that they got engaged, a favourite park of theirs, or a spot they’ve wanted to visit but just haven’t yet! And if you don’t know where to go after answering those questions, maybe this list will help you find that spot! Vancouver has some excellent options for engagement session locations. Many of the ones listed here are free and open to the public. Others may take a little planning or require a fee, but are often well worth it! Either way, you have plenty of great options to choose the perfect location for your engagement session! Here is a list of my current top 15, in no particular order. And yes, my top locations change all the time!! Wanting that beach + rocks + water + cliffs + forest location, all in one? Whytecliff Park, 25 North of Vancouver, is that place for you! Looking for that magical, awe inspiring location a little bit away from the city? You’ll find that here! Whether it’s walking through the tall trees, climbing the cliffs right by the ocean and seeing the BC Ferries sail by, or walking on the beach, this is one of my favourite places for photos time and time again! The gem of Vancouver, one of BC’s most beautiful parks, Stanley Park is iconic for so many reasons. First of all, everywhere you look is beautiful, and there are so many unique spots in the park, whether it’s the seawall, the aquarium, the many lakes and ponds, lookouts, gardens and scenic areas, you can’t NOT come and see the beauty for yourself. Want a mix of modern or rustic photos? You can get both here! Situated on Little Mountain - the highest point in Vancouver proper - this former rock quarry has been converted into a beautiful city park with flower gardens, public art, grassy knolls, and panoramic views over the city. Whether you want photos in front of the water fountain, a stroll through the many gardens and pathways, a view overlooking Vancouver, or a visit to the Conservatory (tickets start at $7 CAD), there is no end to creative and beautiful spots to take engagement photos at this beautiful park! The Sea to Sky Gondola is located on Highway 99 just south of Squamish, a scenic 45 minute drive from downtown Vancouver. A 10 minute gondola ride will take you up to a truly magical place with some of the most spectacular views you will ever see in Metro Vancouver. A popular spot for spectacular photos is the 100 metre Sky Pilot Suspension Bridge. After your engagement session, you can enjoy a meal with a view at the Summit Lodge. Take in the vistas on the Summit Lodge deck and watch the sunset. 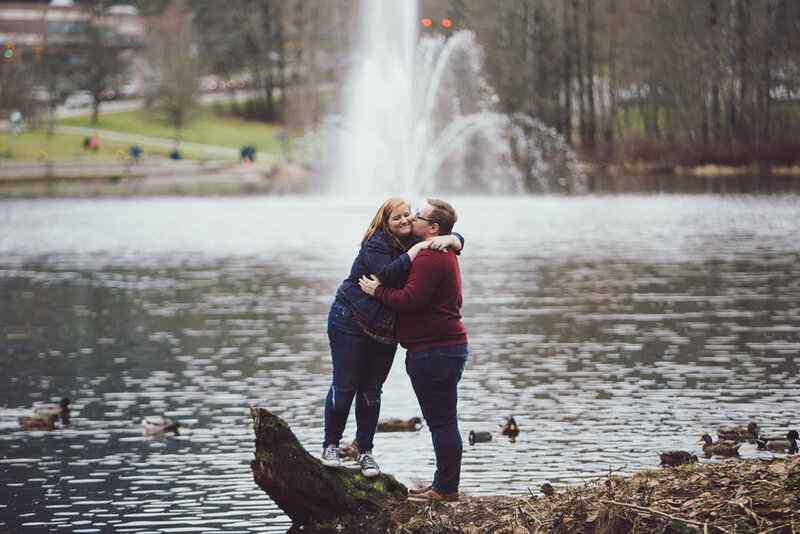 One of Surrey’s hidden gems in my opinion, this beautiful park offers a variety of really intimate spaces for a private and personal engagement session! With pathways, grassy fields, a lake, you can easily spend a few hours holding hands with your fiancé and getting some amazing photographs here. Parking can get a bit busy, but the city has recently added parking by the street, so that should help! Check it out! See Emily and Leo’s Engagement Blog Post here. Looking for a laid back, slower engagement session location, with that small town feel and variety in locations? Fort Langley is the place for you! From the walk by the river, the yellow community hall, the multiple cute bridges, beautiful older buildings, and a diner or two to grab a coffee or some ice-cream at, this little community is the cutest! Parking can be limited, so you might need to park a few blocks away, but it’s worth it! See Erica & David’s full blog post here. A hit with people both local and coming from afar, this beautiful lake has a ton of beautiful spots to stop and take pictures at! You could rent a canoe from the nearby boat rental shop, just enjoy the walk round the lake with a stop on the floating dock, or take a rest on one of many park benches lining the walkway. In the late fall, the lawn by the entrance often has beautiful long grasses, allowing you to get those romantic “walking in a field” photos, with beautiful trees draping their branches down over you! Gastown is filled with beautiful brick road, small cafés, and so much Vancouver history, including the famous Gastown Vancouver Steam Clock! Stroll though the streets, stopping by the many cute alleyways and stores. Love the feel of being IN the forest? Want dramatic engagement photos? Capilano Suspension Bridge is the place for you! Hanging 70 meters above the Capilano River, the bridge and the accompanying CliffWalk are something you need to experience! Perfect for the adventurous and nature loving couple! Wanting a location that makes you feel like you’re in the mountains, but is just a short drive away from Vancouver? Visit Pitt Lake! A popular spot with locals and visitors alike, you’ll be surrounded by water on either side of the dyke, and there are a ton of cute gravel paths, gates, and even a lookout hut that gives you a spectacular view of the surrounding land! Be sure to put it on your list! This place has everything! The beach obviously, but also areas with covered paths and cute little shops to stop at! Whether you’re wanting that water feel, or just want to run on the sand, Crescent Beach is a great place for engagement photos! Probably Port Moody’s most famous park, Rocky Point is a great spot to catch the sunset if you don’t want to travel into Vancouver. It’s got a great mixture of modern and rustic areas in the sense that you can stay in the treed areas and forest, or head out to the dock and enjoy the walkways! You can also stop in at Rocky Point Ice Cream to finish off your engagement session! Yum! With great views of the Pacific Ocean and the Lions Gate Bridge, as well as Stanley Park, Ambleside is a beautiful spot to relax, enjoy the fresh ocean air, and get some beautiful engagement portraits! Walk right by the ocean, climb up on the rocky beach, check out the points that jut out into the water, or run into the shaded forest and get cosy pictures! I have found this spot to be the best for parking! See Joan & Mike’s Engagement Blog here. Home of some of Vancouver’s most popular breweries as well as a large arts district, Granville Island has such a cool feel to it! You can rent a rowboat for an hour, walk with the crowds, grab lunch by the water, or find one of many cool alleyways with buildings painted all different colours! Parking is hard to come by, so be patient as you’re finding a spot or just try and take transit! Open year-round, just 5 minutes away from Coquitlam Centre Mall and steps away from the end of the Skytrain line, Lafarge Lake is one of Coquitlam’s gems. What used to be a sand quarry was filled up with water years ago, and now is a beautiful park for many to enjoy! Walk around the lake, stop by the water, enjoy the forest, or even play some table tennis on the permanent concrete tables; this park has so many picturesque locations for your engagement photos! See Lindsay & Eric’s engagement blog post here. And that’s my list of top engagement session locations in the Vancouver area! Come back often, as I’ll be adding to it regularly! Know someone else who is engaged? SHARE this will them! Think I MISSED a must-see spot? Tell me in the comments below!